When Brian Burke took over the reigns of the Toronto Maple Leafs on November 29, 2008, he said that the Original Six franchise was set to start a rebuild – one that would happen through the draft and with a few trades over the next few seasons. When he brought in Phil Kessel the following year, trading away three high draft picks in the process, he was criticized and questioned on how exactly he would go about this rebuild. Finally, three years after the Kessel deal, the Leafs found themselves back in the NHL playoffs. Young and inexperienced, they pushed the Boston Bruins to game seven and almost moved on. Now, a year later, the team looks to go further. It’s a Leafs’ group that is surely along the lines of what Burke envisioned. Built from all different aspects of the game – drafting, free agency, and key trades – it’s a franchise that has started it’s journey back to its former glory. 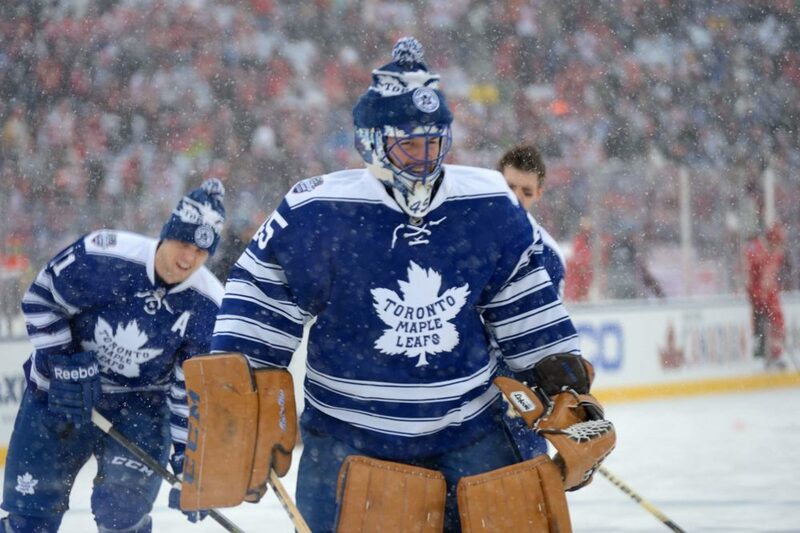 Here’s a look at how the Toronto Maple Leafs of 2013-2014 were put together. Nikolai Kulemin (2006 Entry Draft; 2nd round, 44th overall): The defensive-minded forward was drafted by the Maple Leafs in the 2006 NHL Entry Draft. Although his 30-goal season in 2010-11 created higher expectations for the 27-year old, his defensive play and penalty killing abilities have made him a key part of the Leafs franchise over the past six seasons. James Reimer (2006 Entry Draft; 3rd round, 99th overall): He was a leader amongst the inexperience Leafs during their first playoff appearance in eight seasons. Now, spending a lot of the 2013-14 season on the bench, Reimer appears to be the “1B Goalie” in coach Randy Carlyle’s 1A-1B goalie system. His statistics, however, seem to prove that he has the ability to be a number one on an NHL team. 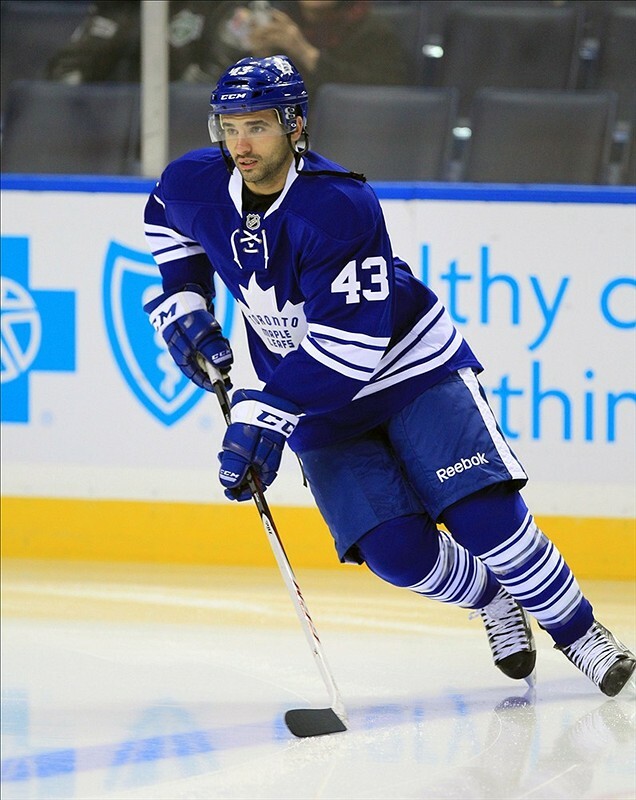 Nazem Kadri – (2009 Entry Draft; 1st round, 7th overall): At 23, Kadri seems to have found his offensive prowess that he was drafted for. In the shortened season, the former first-round pick scored 18 goals and 44 points while playing all 48 games. After holding out to start 2013-14, he was awarded a two-year contract worth roughly $6-million. In return, Kadri has recorded 31 points (12g-19a) in 48 games to start the 2013-14 season. Morgan Reilly (2012 Entry Draft; 1st round, 5th overall): The young defenceman has recorded two goals and 13 assists in 43 games in his first season with the big club. Although he has a minus-11 rating, his playing with Jake Gardiner is a message from coach Carlyle that the two will learn to play at the NHL level – even if it means his plus-minus rating suffers. But playing against some of the top players, and averaging over 12 minutes of ice-time, Rielly’s game has improved even from the start of the season – and should only get better. Tyler Bozak (Signed as a free agent April 3, 2009): Signed as a free agent out of the University of Denver during the Brian Burke era, Bozak has taken on the role as the number one centre in Toronto. The job hasn’t come without criticism. While many people believe the Leafs are still searching for a top line centre, Bozak’s chemistry with line mates Phil Kessel and James van Riemsdyk has led to consistent production since becoming a Leaf in the 2009-10 season including 25 points (9g-16a) in 28 games to start 2013-14. Colton Orr (Signed as a free agent July 1, 2009): A career tough guy, Orr was brought in for nothing else other than to toughen up the Leafs’ lineup. The Leafs originally signed the enforcer to a four-year deal in 2009, and most recently re-signed him to a two-year, $1.85-million contract. Jay McClement (Signed as a free agent July 1, 2012): Brought in on a two-year, $3-million deal as a defensive forward, McClement won’t put up a whole lot of offensive numbers. However, he has become the go-to guy for the Leafs on the penalty kill. David Clarkson (Signed as a free agent July 5, 2013): One of the most coveted free agents coming out of the shortened 2012-13 season, David Clarkson decided it was time to come home to Toronto. The Leafs signed the Mimico-native to a 7-year, $36.75-million contract. While he’s had a rough first year in blue and white – with injuries and suspension – don’t expect the drought to last for the length of his contract. He’s a tough power forward with some soft hands and can be a force in the offensive zone which should help his linemates over the next six seasons. Trevor Smith (Signed as a free agent July 5, 2013): Signed by the Leafs was signed prior to the season to a one-year deal. As an early season call up, he impressed by scoring rather important goals at seemingly perfect times. Unfortunately, injury has sidelined the 28-year old most recently and could find himself back in the AHL upon his return. Troy Bodie (Signed as a free agent July 10, 2013): He’s seen little time so far for the blue and white, but has been a physical force up front when in the lineup. Signed to a one-year contract prior to the 2013-14 season, he’s been used to fill holes throughout the lineup when injury bug hits. Paul Ranger (Signed as a free agent July 24, 2013): After an abbreviated absence from hockey, Ranger re-entered the league signing a one-year deal with the Maple Leafs worth $1-million. He’s been in and out of the lineup with the Leafs’ plethora of defensemen and has looked rusty at times throughout the year. Mason Raymond (Signed as a free agent September 23, 2013): Casted out of Vancouver after an injury plagued couple of seasons, Mason Raymond was invited to Leafs training camp. After impressing the Leafs’ coaching staff, he was signed to a one-year, $1-million contract – a contract that seems to be paying off for the blue and white. Thus far, he’s recorded 32 points (13g-19a) in 53 games and he’s on pace to finish the season with 49 which would be his second best total since playing with the Sedin twins during the 2009-10 season. Jerred Smithson (Signed as a free agent November 6, 2013): Desperate for centres, the Leafs signed Smithson to a one-year deal worth the league minimum. Since his signing, he’s been up and down between the Leafs and AHL Marlies. Phil Kessel (Acquired September 18, 2009): Arguably one of Brian Burke’s most controversial trades, he brought in Kessel from Boston in exchange for Toronto’s first- (Tyler Seguin – now in Dallas) and second-round (Jared Knight) picks in 2010 along with their first-round pick (Dougie Hamilton) in 2011. However it doesn’t seem to be questioned as often anymore with Kessel consistently showing up offensively with 305 points (145g-160a) in 335 games with the Leafs. Being named to his second Olympics in the past eight years, there’s no sign of him slowing down anytime soon. Dion Phaneuf (Acquired January 31, 2010): Brought over in one of the biggest deals of the season, Dion Phaneuf was acquired from Calgary alongside Fredrik Sjostrom and Keith Aulie in exchange for Niklas Hagman, Jamal Mayers, Matt Stajan, and Ian White. While both Sjostrom and Aulie would find themselves in other markets in the years that followed, Phaneuf became a leader for the Maple Leafs and the eventual captain of the storied franchise. Most recently, he signed a seven-year deal that will see the big hitter remain a part of the Leafs for the foreseeable future. Jake Gardiner (Acquired February 9, 2011): Part of the youth movement that is now hitting the Leafs’ lineup, Gardiner was acquired from Anaheim along with Joffrey Lupul and a 2013 fourth-round pick (Fredrik Bergvik) in exchange for Francois Beauchemin. Although it remains a learning curve for the young blueliner he’s seen ample ice time alongside fellow young gun Morgan Rielly. Joffrey Lupul (Acquired February 9, 2011): In the same deal that brought Jake Gardiner to the Leafs, the team acquired Lupul who has been an offensive gem for them when he’s in the lineup. The only problem is his uncanny ability to be hit with the injury bug. He’s missed far too much time to find himself among the league’s elite, but remains a vital part of the Leafs lineup posting 132 points (60g-72a) over parts of four seasons with the Maple Leafs. Cody Franson (Acquired July 3, 2011): Acquired in the Brian Burke era, Franson came over from Nashville along with Matthew Lombardi in exchange for Brett Lebda and Robert Slaney. Franson has been a force on the Toronto blue line including an impressive offensive output in the 2013 playoffs. The Leafs were able to sign him prior to the 2013-14 season with a contract that many considered a steal for the team at one-year and worth only $2-million. Mark Fraser (Acquired February 27, 2012): Fraser was brought in from Anaheim in exchange for Dale Mitchell. Who? I said Dale Mitchell. While Mitchell has certainly not seen much ice time in Anaheim, Fraser has been a physical entity on the back end for the Leafs. Carter Ashton (Acquired February 28, 2012): Acquired in a trade with Tampa Bay, Ashton hasn’t quite found a permanent job with the Maple Leafs just yet. He was brought over in exchange for blueliner Keith Aulie and in 42 games has yet to record an NHL goal. James van Riemsdyk (Acquired June 23, 2012): The Maple Leafs sent Luke Schenn to Philadelphia in 2012 for van Riemsdyk – who at the time was coming off a somewhat injury-filled couple of seasons. However, since being placed on a line with Kessel and Bozak, he’s been a constant offensive threat. Lucky for the Leafs, he’s signed through the 2017-18 season and should remain a big part of their increasingly young team. Jonathan Bernier (Acquired June 23, 2013): In one of the more unforeseen offseason moves, general manager Dave Nonis went out and acquire former Kings’ backup Jonathan Bernier. In return, the Kings got forward Matt Frattin, goalie Ben scrivens and Toronto’s second round pick in either 2014 or 2015 Entry Draft. Nonis followed up the trade by signing Bernier to a two-year deal worth $5.8-million bringing Reimer’s future with the team into question. Dave Bolland (Acquired June 30, 2013): A draft-day deal, the Leafs acquired two-time Stanley Cup champion Dave Bolland from the reigning champs Chicago Blackhawks. The Hawks received Toronto’s 2013 second-round pick (Carl Dahlstrom), Anaheim’s 2013 fourth-round pick (Fredrik Bergvik – who was later traded to San Jose) and a fourth-round pick in the 2014 Entry Draft. Bolland, who had a great start to the 2013-14 season with his hometown team, has been sidelined since November 2 with a lacerated tendon in his ankle. Peter Holland (Acquired November 16, 2013): A guy who’s seen numerous minutes thanks to the injury bug at centre, Holland was acquired in a trade with Anaheim alongside Brad Staubitz in exchange for Jesse Blacker, a conditional second-round pick in 2014 and their own seventh-round pick in 2014 which the Leafs had previously acquired. Although he’s not a lethal offensive player, his ability to forecheck has opened up the game offensively for his linemates. Tim Gleason (Acquired January 1, 2014): While the Leafs played in the 2014 Winter Classic, GM Dave Nonis made calls and landed veteran defenceman Tim Gleason from Carolina in exchange for John-Michael Liles and prospect Dennis Robertson. Gleason – a burly, physical blueliner – has already made his presence felt blocking key shots to weather late period storms in the past two weeks. He’ll be a key player down the stretch if the Leafs hope to push their way into a second consecutive playoff birth. Frazer McLaren (Claimed January 31, 2013): Claimed of waivers from San Jose, McLaren has certainly made his presence felt taking on anyone and everyone wearing an opposition jersey. Any questions or comments, leave them below or contact Andrew on Twitter @AndrewGForbes.